No matter how many vegetables we eat, or how many supplements we take, if we are stressed out we are still going to be unhealthy & unable to function optimally. Always being on the go, Jess finds that the deep relaxation provided by her yoga practice critical in sustainably keeping her healthy, energized, active & on track to achieving her goals. 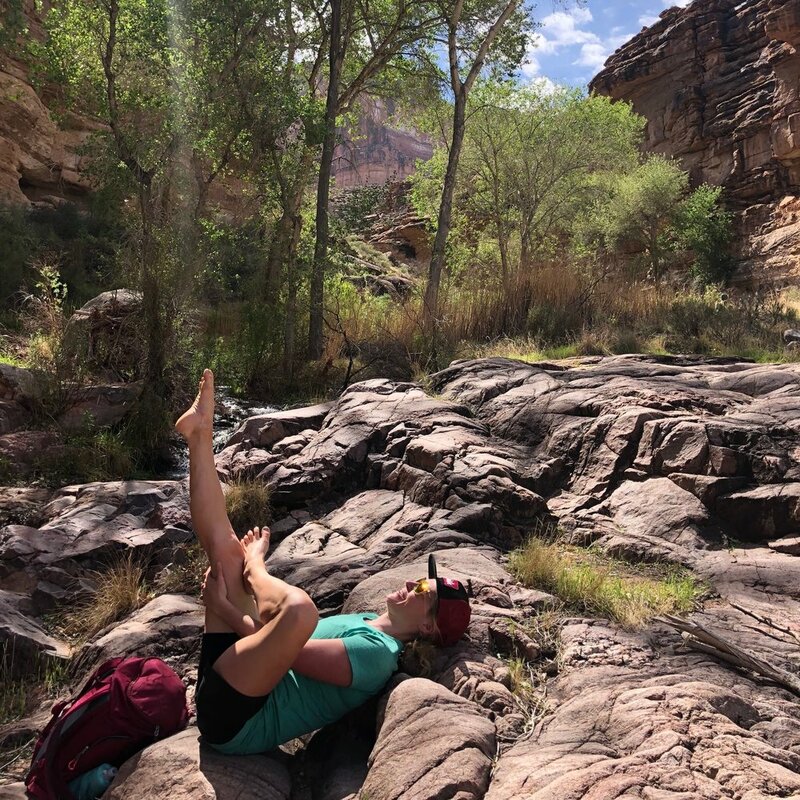 The more she learns about the practices the more she realizes their importance and the necessity of taking regular time out to relax – not only for boosting performance on the trails & in the office, but for amplifying life with more mental & physical health. The foundation for everything awesome. There are many things you can do to relax, & as part of our coaching programs we explore those that may be the most beneficial or resonate with you the most. Yoga is a particularly fabulous way to relax & refresh as each pose offers so many benefits its like killing multiple birds with one stone. Poor birds. The poses in yoga are also a great way to babysit you through relaxation, as let face it, if you weren't doing yoga would you be relaxing? To complement an active & busy life, Jess practices & teaches chill one on one personalized yoga sessions that draw from Qigong, Restorative Yoga & Yin Yoga. Whether your brand new, looking to find out more to deepen your existing practice, touch base with Jess to discuss how she may be able to help you be more awesome via the exploration of yoga. Be excited. It's exciting! BUT when I chill out, nothing is happening, therefore its nothing but a waste of my precious time! WRONG! There are so many things that take place in the body when we relax. Chilling out actually has limitless benefits to our wellbeing & health! Reduced blood stress hormone levels - this benefits every organ system in our body! Out of anything we could invest in...learning how to manage our STRESS LEVELS would have the greatest impact on our health & wellbeing. Stronger immunity reducing our susceptibility to illness. Uplifted mood & eased depression. Enhanced clarity of thought & creativity - brain fog see ya later & hello free flowing ideas with purpose! Slowed "bad" parts of our natural aging process (wrinkles, decreased mobility & onset of toxicity diseases) & enhanced "best" parts of aging (improved judgement and access to our inner wisdom). Better quality breathing (improves transport of nutrients & energy to all body tissues). Reduced muscle tension & increased flexibility. Taking time out for relaxation will benefit every organ system within the body - nervous, digestive, intestinal, cardiovascular, respiratory, endocrine, skeletal, muscular, lymphatic, reproductive, integumentary, immune and urinary systems. Reward the body with some time out & it will reward you. All three of these practices help support our emotional, physical & mental health so that we can be more awesome! Each practice is exceptionally valuable in its own right, and Jess further catapults the goodness on offer by selecting powerful combinations of these complementary practices in her one on one yoga sessions.